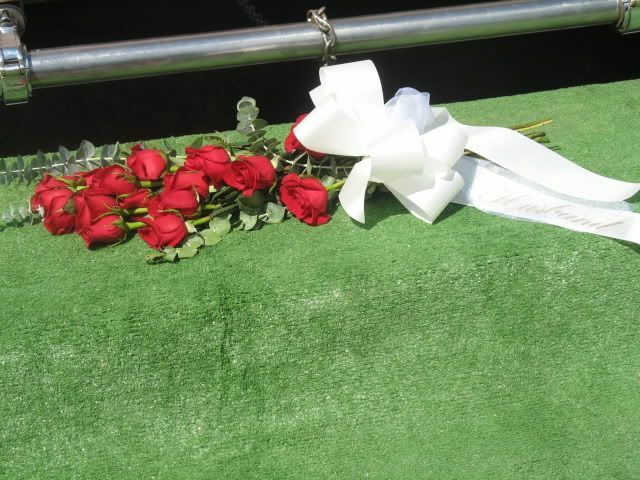 It's been a week already since Dad was buried. Hard to believe. Hard to grasp. Hard to get used to. A few days ago I was driving to the grocery store when the reality of his loss hit me anew and I suddenly just blurted aloud, "Dad is dead." Almost instantly I felt my throat tighten and the tears well up. After just a moment or two had passed I changed tactics a little and said instead, "Dad is in heaven!" For him--what a lovely change of place. For me--what a lovely change of pace. Sorrow to gladness in 4.5 seconds. How grateful I am for the hope of heaven. 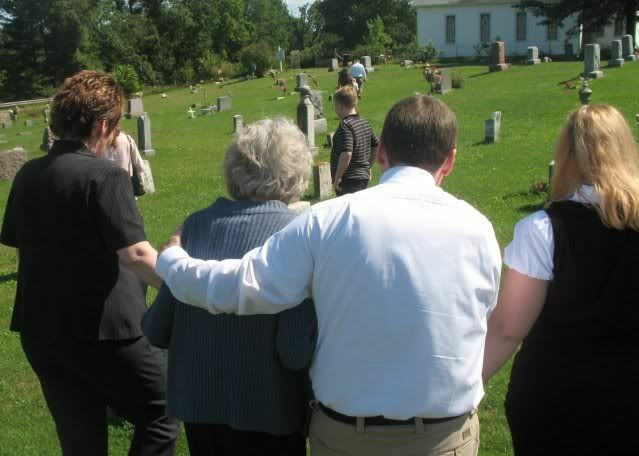 We committed Dad to the hope and the hands of heaven last Saturday in the serene and lovely Shamrock Church and Cemetery. For me at least, the small family ceremony we had there in the midst of that halcyon piece of heaven was the most meaningful, poignant part of the day. 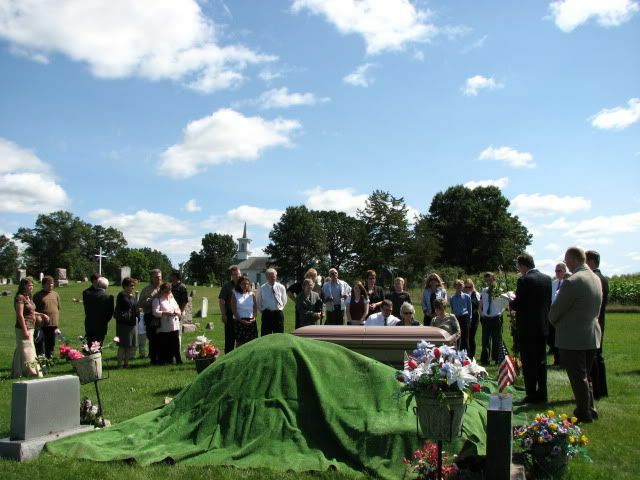 First, as I've mentioned before, there was the graveside service. 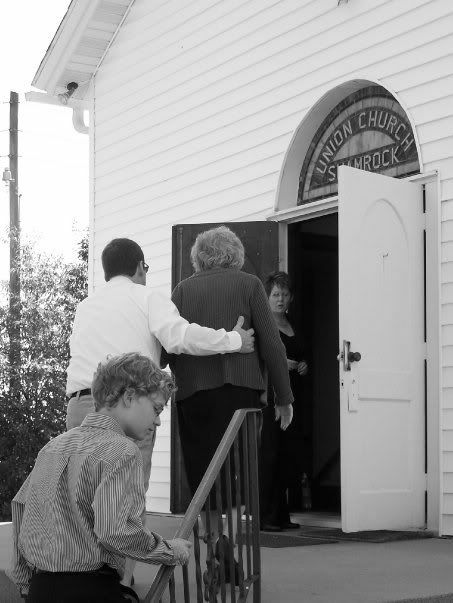 . .
On the way in the door, Mom gave the old bell a good pull which was a really nice way to send a hello to heaven. 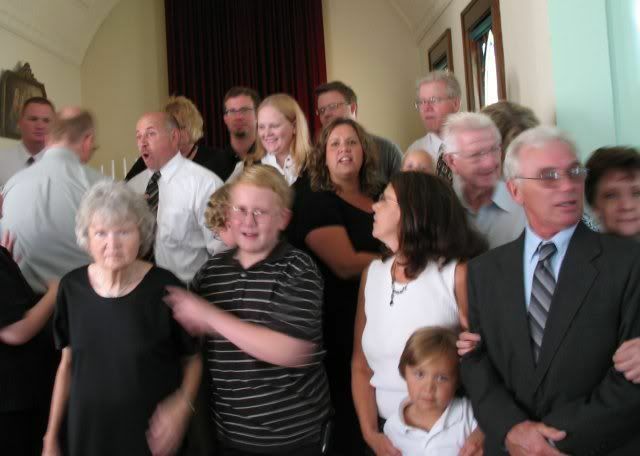 The service in that diminutive sanctuary was not formal or excruciatingly well organized; we just meandered happily back and forth between the sharing of memories and the sharing of old hymns. This is my oldest brother, Tim. 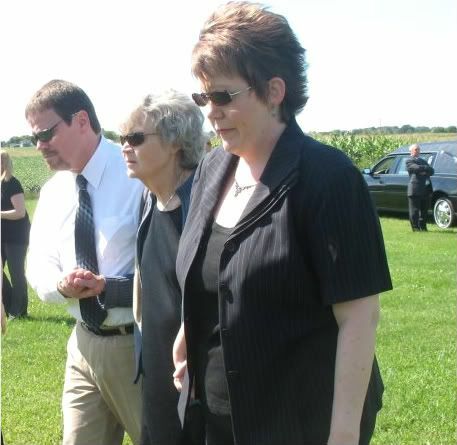 His wife, Berit, and son, Andrew, are beside him. Sarah said that her grandpa's nickname for her was "Bumpee" and that she remembered him coming to the hospital during her cancer treatment to cheer her up. In between the memories shared, different people would yell out favorite hymns and away we would go on a song. 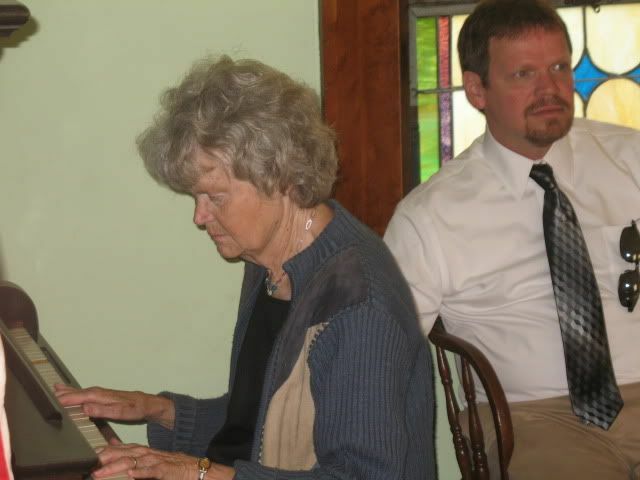 Fortunately, I got cut my teeth on church hymns so I was quite happy to do the "piano honors." 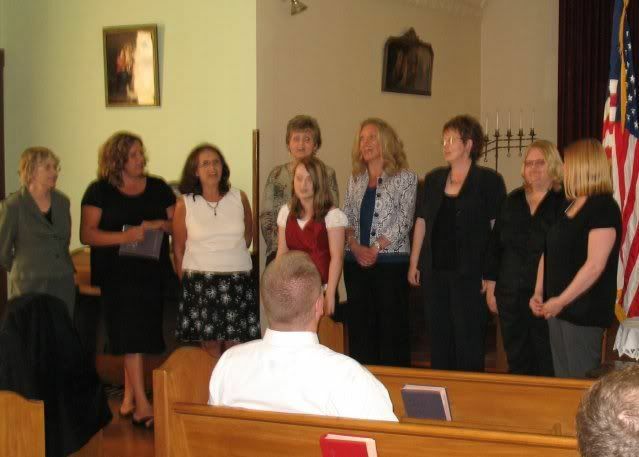 One of the highlights of our informal gathering was when Randy invited the ladies forward to sing. 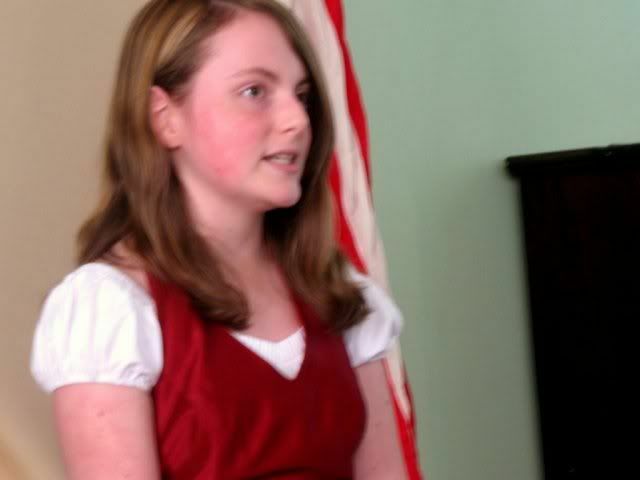 Guess who played the piano for THAT musical number? Not me, that's who! 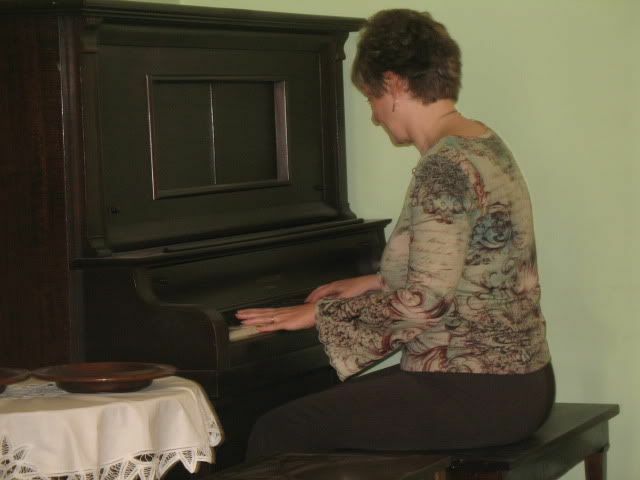 It was such an inspiration to witness a woman who had just buried her husband still be able to find the emotional strength to sit down at a piano and play, "What A Friend We Have in Jesus." 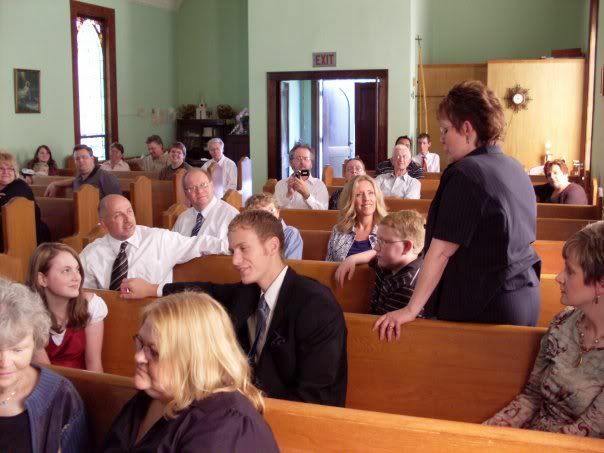 Although her husband and earthly friend was gone, her best Friend was very present in that room while we sang. At the end of that lovely hour, we got ourselves organized for a family photo. I've always been the type of person who loves taking pictures before and after the "real photo" and so that's what I did. 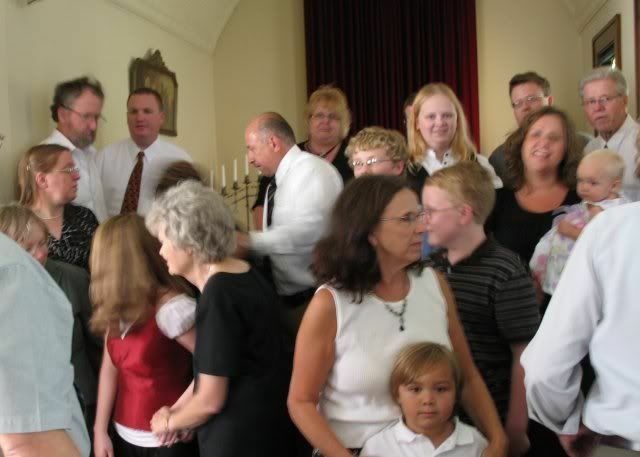 Eventually, everyone got lined up and we photographed a memory. Following the sharing of the pictures, the memories, and the music, all of us joined hands and said The Lord's Prayer together. 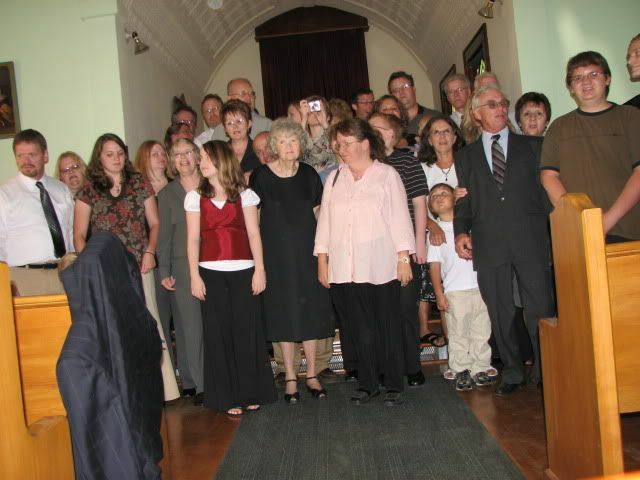 To my mind, there are few sounds on earth any sweeter than family voices wending their way through the dusty sacredness of a tranquil, country church. 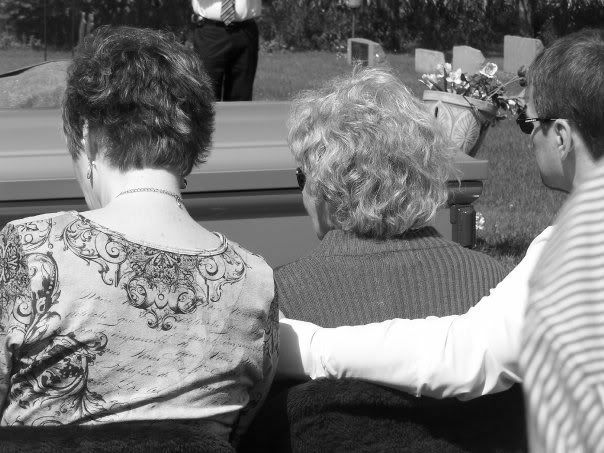 After the final "Amen," was said, some of the family members stayed around to chat. 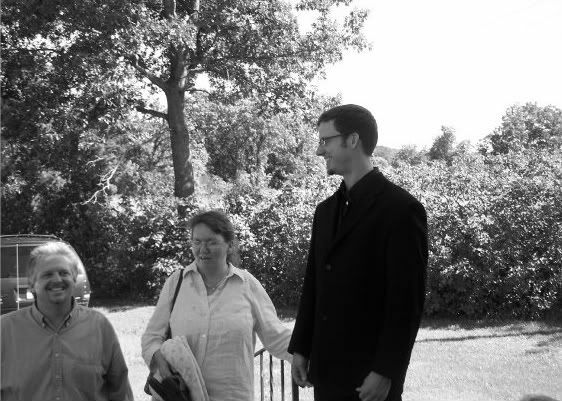 This is my sister, Ruth, her husband, Arnold (on the left) and our cousin, Jonathan. 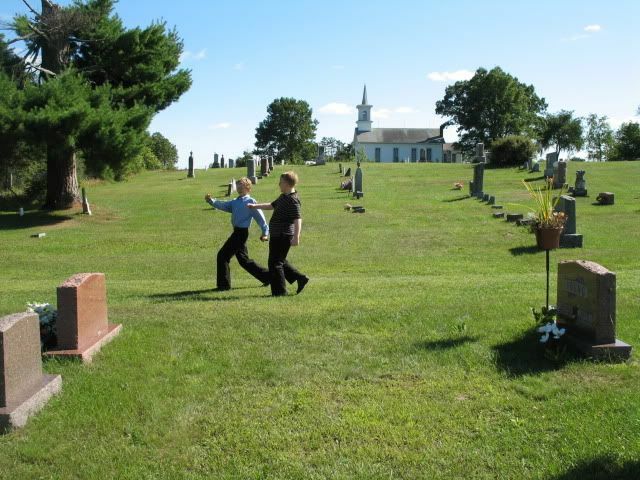 As a few of us walked back out to the cemetery, I happened to notice that my nepehws had developed their very own wonderful and wacky way of walking. 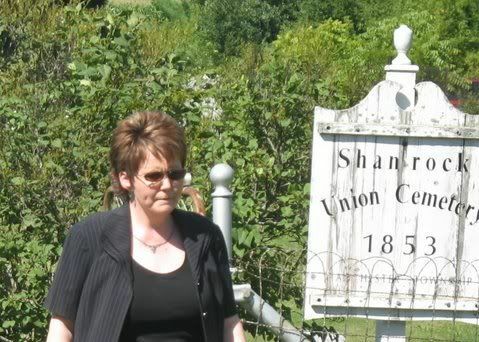 My siblings and I have grandparents, great grandparents and great great grandparents who are buried in that cemetery; after a bit of searching, we found some graves with familiar names. This is the grave of my dad's parents. The last name isn't "Campbell" because Dad's birth dad died when my dad was just a couple days old. His mom later remarried. 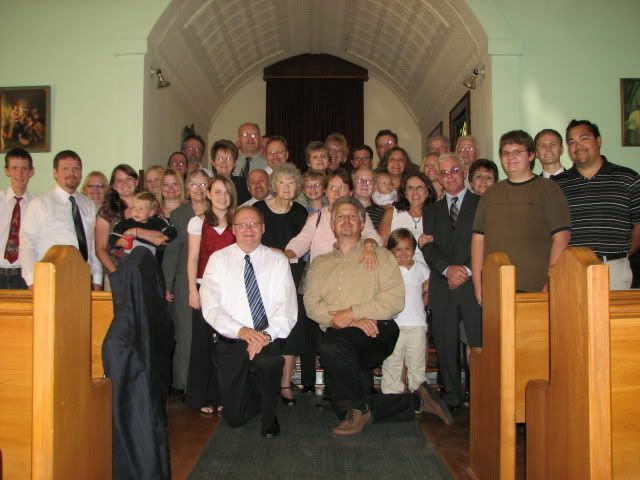 Even though the afternoon at that church was so very special, the most meaningful part of the day for me was thinking back to when when I was a young girl and remembering how our family would occasionally drive half an hour or so from our home to the church. (The church was always unlocked back then. It is also also quaint enough that it still has "working" outhouses!) We would go and sit in the sanctuary during the week, just to enjoy its serenity and its beauty. 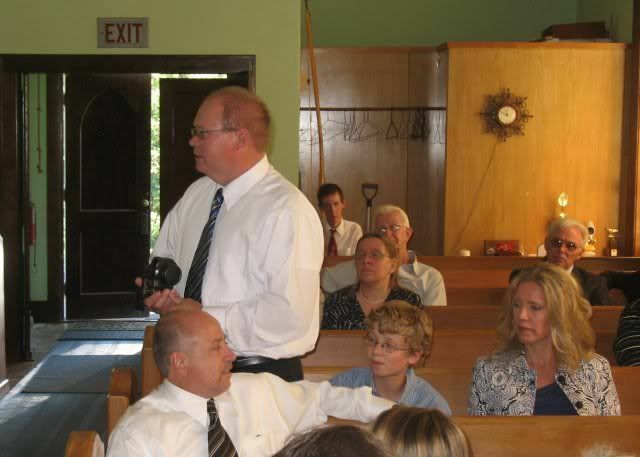 I remember so well how I would take my little girl self up to that platform (with mom playing the piano) and belt out songs to the empty pews, picturing in my heart the day when I would stand on church platforms and sing for real. During those magical moments last Saturday I kept saying to myself, "Don't rush through this. Don't think about tomorrow or next week. Don't worry about selling the house or finding a new church. Moments like these don't come very often and they're gone almost before they begin. I reminded myself to honor the memories that brought me there, to honor the memories that were being made, and to honor the man in whose memory my family and I had gathered. And most of all, I hoped that the memories, the music, and the prayers we had offered that day would all coalesce into a holy hello--a hello to both of my fathers who are in heaven. I wasn't able to type this info in the video entry below so I'll introduce the video here instead. In the post below, you'll find a video of us ladies singing, "What a Friend We Have In Jesus," the song that I wrote about in the post above. OF COURSE your father was there listening to you sing and cheering you on!!!!! I'm sure when you think back on the moment, you will feel his presence then, now, and forever. I would love if you would write about your "pseudo" brother Ron, how that came to be, who he is and how he became a Campbell? You make so many references to him, and I just know there is a poignant and loving story to be told. Now I have to go watch the video. Thanks for sharing. Thank you for sharing this very beautiful and poignant memory with us. Thank you for taking us through your journey of sending your Dad to Heaven. I have many tears, but peace be with you. You are such an inspirational writer. Thank you for sharing your life with us. ... so beautiful and precious!! thanks for sharing a glimpse of your amazing family. "Dad would have loved it", that's for sure! What a joy-filled, rich legacy your dad has left for all of you! 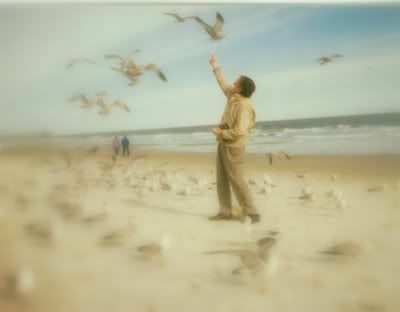 Sometimes that fact that they are in Heaven is the only solace that I can find, but that usually is enough. Yesterday was a hard day for me as I remembered it was my parents anniversary, and all those celebration memories came back, but I was at work and had to choke back the sorrow and I know they are with their Lord. You Mom is receiving strength from her deep faith in the One who she has trusted in for so long, truly we do have a friend in Jesus. I haven't checked you all for a while and had alot of reading to do today! 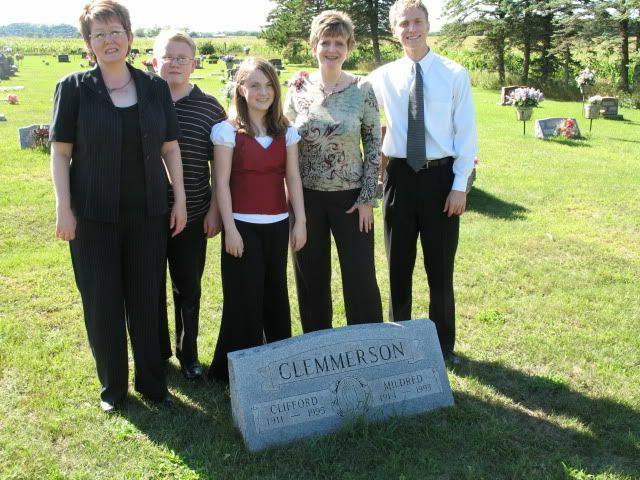 my mother in law is a clemmerson! 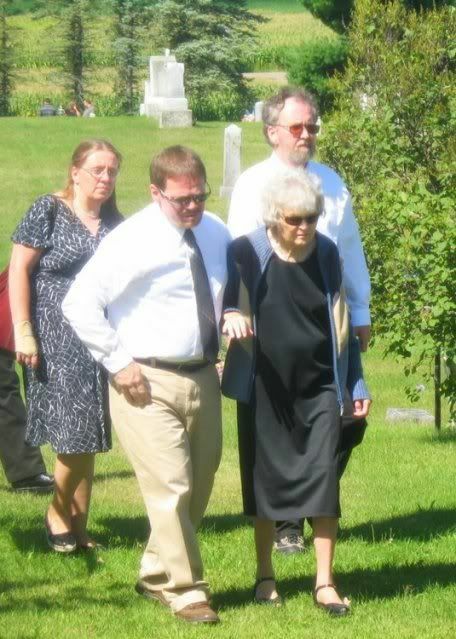 she is married to robert clemmerson of black river falls wi. wonder if its any relationship? I've just read some of the details of your daddy's passing for the first time. How very sad and beautiful at the same time. It's such a consolation that you will see him again one day. Meet Our First Blogger Discussion Starter Person!